Two Days. 76.2 Miles of Rugged Challending Trails. No Blisters (thank you Drymax Socks). 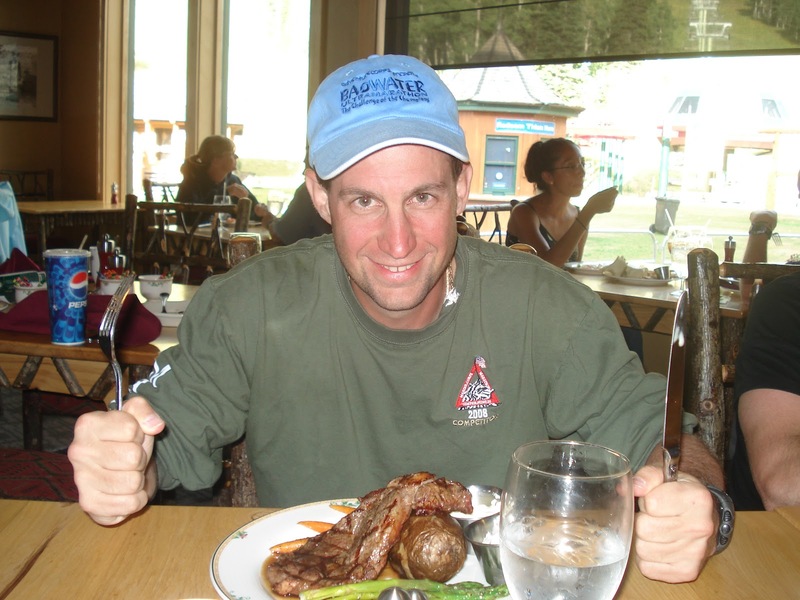 I am not sure when I decided that I would attempt to run what is now known as the Grand Tetons "Double", but I do remember the circumstances. Running the Grand Teton 100-Mile Trail Race had become somewhat of an annual event for me the last two Labor Day weekends (see "2008 Race Report : Grand Tetons 100 Mile Race"). It was my first 100-miler (back in 2007). 2009 was to be my 3rd GTR100. 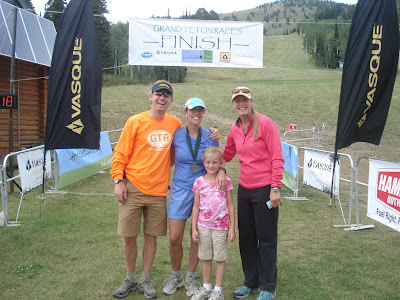 Somehow, I was able to convince my wife to run the Grand Teton Trail Marathon as her very first marathon - well, ok, so I just signed her up for it an told her she was going to do it. The concession - I'd have to run it with her. 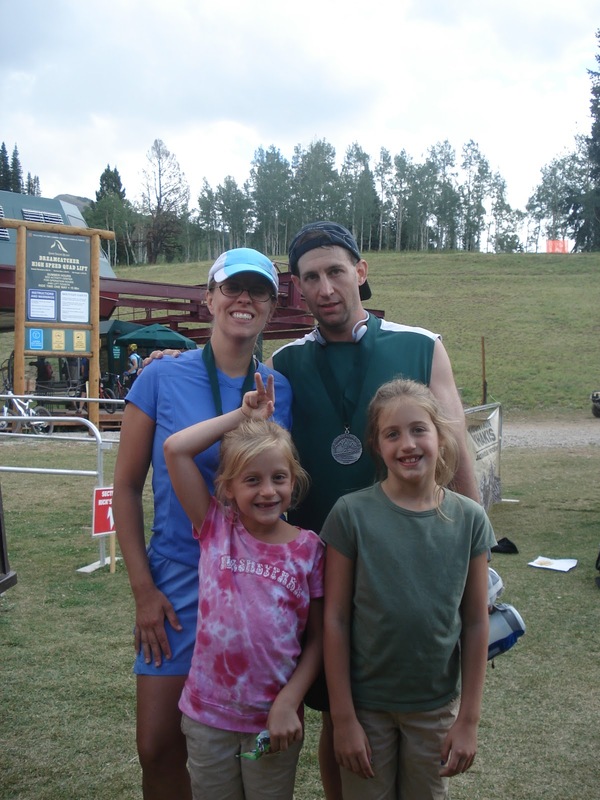 Travel across the country for a family vacation to run 26.2 miles ? Not. So, as fate would have it, I signed up for both the GTR 50 Mile (on Saturday) and Trail Marathon (on Sunday), and boy was it a blast. The sections are actually arranged in order of difficulty (not sure if that is intentional or not). The first 5.6 miles features a climb to the summit of Fred's Mountain (the top of the Dreamcatcher Chairlift) via a service road, approximately 1,840 feet of constant ascent (taking runners from about 8,000 feet to 10,000 feet elevation), a few technical, rocky sections, and a quad-busting descent down the very same service road that brought you to the top. The next 14.4 miles begin with yet another climb (about a mile) up a service road, before turning into a single-track trail climb to Lightning Ridge. Finally, you descent into Teton Canyon, emerging at Mill Creek, only to face a 3.2 mile switch-back climb up Ski Hill Road to Cold Springs. The climb to Cold Springs isn't the half of it. The course proceeds to descend a bit more, but then turns right back in to ascent - about a mile of it back to the top of Lightning Ridge, and then another short, steep climb to the service road junction. The Rick's Basin section is not nearly as difficult as the first two sections, but it has its own steep climbs to boast about. It consists, however, of primarily rolling hills on single-track trails. Four loops for the 100-mile, two loops for the 50 mile. It is as simple as that. The Trail Marathon race course follows the same course as the 100/50 course, but adds a 1.2 mile climb to the top of the Shoshone lift. Aside from a tremendous challenge on a physically demanding course, the Grand Teton Races are a great opportunity to catch up with old friends (and meet new ones). This year was no exception. 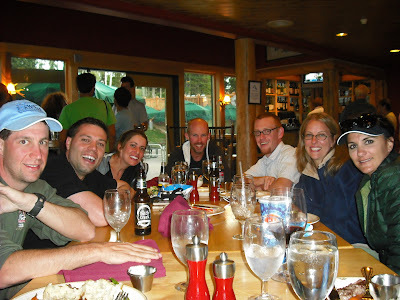 Many old faces made appearances (either to run, volunteer or just to hang) - Badwater crew members Lane and Jen Vogel, Steve Tursi, Adam Gifford, Dusty Hardman, Sean Meissner, Bryon Powell, David and Jamie Donaldson, Peggy Gaudet, George Velasco, Terry Madl, Sister Mary Beth Lloyd, Heather Wilcox, and Kira Matukaitis, just to name a few. The course lends itself to being very family and crew friendly. The clover-leaf design brings runners to the main aid station 3 times per loop. So, let's break this thing up into pieces and see if we can't give a good sense of how much fun a trip to the Grand Teton Races can be. Pre-Race Stuff - Being a Labor Day Weekend event, GTR is the perfect excuse for a family vacation. Me, my wife, our two daughters, my parents and my brother all made our way from New York City life to the expanse of Wyoming the Saturday prior to Labor Day Weekend. We started with a two day trip to Yellowstone National Park, where we quickly learned that there are a limited number of times that one can watch Old Faithful erupt and stop to look at Bison before going absolutely bonkers. As beautiful as it all way, I was pretty happy to move on to the Grand Targhee Resort on Tuesday (the site of GTR). It felt like we were the only ones at Targhee, at least until Thursday when race-weekend folks started to trickle in. I ran/walked Fred's Mountain on Wednesday just for fun, and actually felt some quad soreness for a day or so after. On Thursday I hiked a portion of Fred's with Steve Tursi and his son, who is a total trip - such a good kid, and tremendously funny. The girls did some rock wall climbing and horseback riding, and also put in a few serious hikes on the trails. My youngest daughter and I helped George and Terry mark a portion of the course on Wednesday. At race registration I finally met super-runner Dane Rauschenberg, who ran 52 marathons in 52 weekends (you can read all about it in his book, "See Dane Run - One Man, 52 Weekends, 52 Marathons"). And, of course, I had a few too many beers with Lane over the course of the weekend. It was odd, but refreshing, to have my wife running in the trail marathon. I found it nice to shift the focus to her attempt at her first marathon, and actually found myself not really thinking about preparations for the weekend. All I really cared about was to make sure I packed enough pairs of Drymax Socks for the week. Well, maybe there was something to focus on. Jamie had recently hooked me up with Meredith Terranova. Not only is Meredith a top-notch ultra runner, but she is also a nutritional guru. GTR was the perfect opportunity to test out the race nutrition plan that Meredith had suggested I use, which was pretty simple and all-liquid (basically, Perpetuem, Gu Roctane and S-Caps). David made it even easier for me. Prior to the 50-mile start he mentioned that he mixes gels with Perpetuem, allowing a more consistent absorption over time. I know a little something about mixing gels with fluids (thank you Jen Vogel; see the video "Slipping Gu Into Everything") in the July 27 blog-post titled "More Badwater Musings"). I would later find out that I wasn't quite getting enough calories as I thought I was. Ginette was my crew-person for the 50-mile, making sure I had freshly mixed Perpetuem every time I hit the main aid station. She was supposed to mix a Gu in with each bottle of Perpetuem, but she only did it once every 2 or 3 times in. Oops. Nevertheless, it all worked well, and it was simple too ! I didn't eat a thing off an aid station table for the entire 50-mile race (except for a slice of watermelon). 50-Mile Race - Two loops. 12 hour goal time. That's all I have to do. Whew ! For the last two years it has been a 4-loop countdown. I started the climb up Fred's Mountain and quickly settled in with a small group of runners that I would hang with the entire way up - Dusty, Adam and Heather. I suppose this is as good a time as any to talk a bit about Dusty. This girl is amazing. I spent a majority of the 50-mile race and the entire Trail Marathon with her (we were the only two, and the first ever, to complete the Grand Tetons "Double"). Dusty suffers from Addison's Disease, a severe or total deficiency of the hormones made in the adrenal cortex, caused by the destruction of the cortex. Some of the symptoms include a chronic, steadily worsening fatigue, a loss of appetite, and some weight loss. Blood pressure is low and falls further when a person with Addison's is standing, producing lightheadedness. Nausea, sometimes with vomiting, is common. The muscles are weak and often go into spasm. There are often emotional changes, particularly irritability and depression. Fatigue, loss of appetite, nausea, salt cravings, light headedness? And she runs ultra marathons? I'm not going to say that Dusty embraces and rejoices over the hand that she has been dealt in life, but she refuses to let it get in the way of what she wants to do and accomplish. She has a web-site that is dedicated to helping Addisonian's find solutions to the problems and to provide support. So, Dusty, Adam and I headed up and down Fred's Mountain together. We saw plenty of the 100-milers on the way up (as they were descending). We would pass many other runners throughout the day. Ultimately, I would end up running with Dusty for the first 27 miles. It wasn't until a good portion of the second climb up Fred's Mountain that I lost her. She got to the top 3 minutes ahead of me, passed me on the way down, and I would not see her again until the finish. I was on my own until about a mile into the Mill Creek Section of the second loop, when I ran up on Lynne Hewett (a fellow New Yorker). Runner her first 100-miler, Lynne was steady but was struggling. Rather than venture ahead, I stayed with Lynee for the remainder of the 14.4 mile loop and about 3/4 of a mile of the Rick's Basin Section. We talked, hiked the road portion with Sharlyn Izurieta (who was running the 50, had hip issues, and still ended up beating me and Dusty to the finish line), and together got through the section. When we began the 5-mile Rick's Basin Section, Lynne insisted that I go ahead and get my 50-miles over with. I felt really strong at that point, and had thoughts of catching up with Dusty. She had opened up a 16 minute lead on me with 5 miles to go. I was only able to shave 10 minutes off of it in the last 5 miles, finishing in 12:00:27. Heather had a great race. Kira finished despite ankle problems. 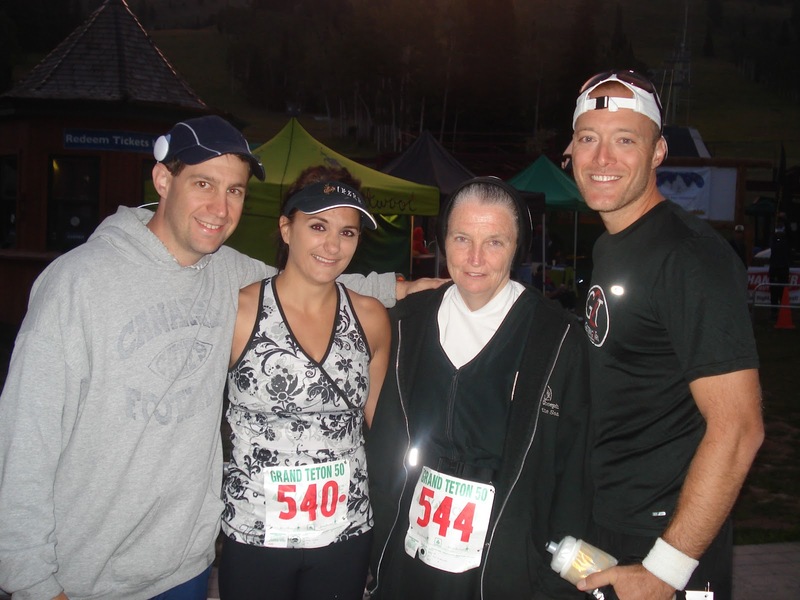 Sister Mary Beth spent 21+ hours on the course en route to a finish. And, Steve Tursi returned to exorcise the demons of a 2008 DNF to finish in 17:16:17. Post 50-Mile Race - After finishing and cleaning up, I had a quick dinner with the family and the Wilcox clan, and watched some of the runners still on the course come and go through the main aid station. Having to get up and do it all over again in the morning, sleep was on my mind. I know, I know, no fun alcohol-related post-race stories ? Not this time. Trail Marathon - The Trail Marathon was more about having fun than anything else. 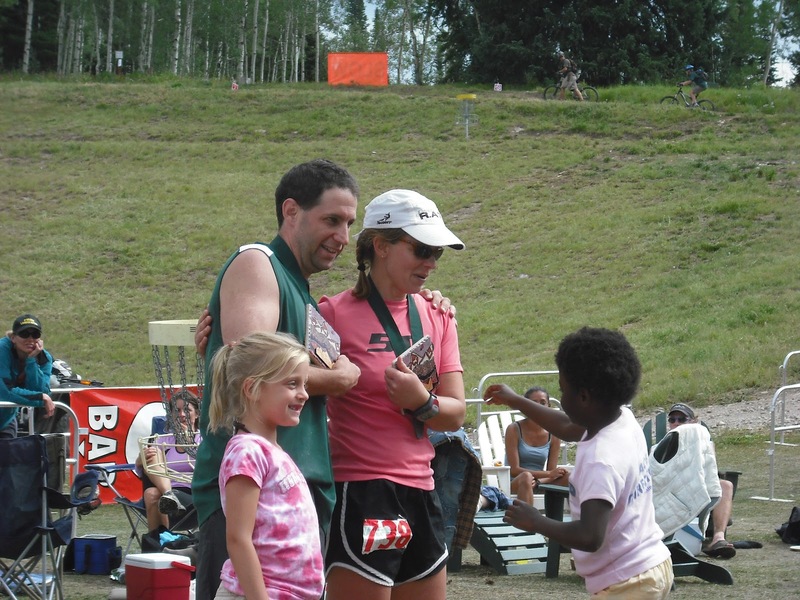 The original plan was to run the entire race with my wife and support her through her first marathon. We headed out to the race at about 6:30 AM where we met up with Jamie and David, Adam, Beth, and the rest of the trail marathoners. Jamie was running the Trail Marathon just hours after pacing eventual 100-mile women's winner Ashley Nordell for 25-miles, and just 2 weeks after running the Leadville Trail 100. Today would be a day for the wives, as David and I both got our rear ends handed to us. As the race was about to start, I went up to the front to take a picture and video of the start of Ginette's first marathon. Race Director Jay Batchen announced to the rest of the marathoners that Dusty and I had run the 50-mile race the day before. We got a few funny looks and cheers. The next thing I know, the race has started, I have my picture and video, and Ginette is half way up the hill. I wouldn't see her again until the finish, which, I think, was actually better for her. She ran such a great race, and hung in there to finish in 7:04:52. 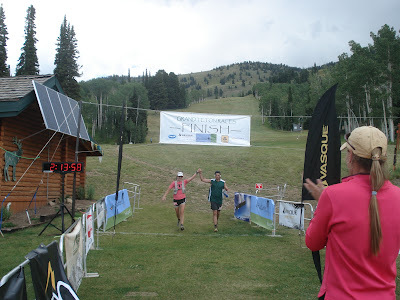 Her first marathon, on trails, in altitude, with 5,000+ feet of climbing. Amazing. .....David - trying to catch her. The race for me was fantastic. I spent the entire 26.2 miles with Dusty. We struggled up the hills, sped our way on the downs, and really got to know each other. We also spent an enormous amount of time picking up trash. It was just insane how much trash that was thrown on the trails by runners. Gel packets, bottles, wrappers and other junk. There was a lot of it, and it was piling up in my back pocket. It is too bad that people simply can't respect the trails and have to deposit their garbage on them. Dusty took a great video of me picking up some junk - it was painful to bend down and made for some great comedy. The video is below - careful, it isn't all "clean". 2009 Grand Teton Races - Trail Trash from Tony Portera on Vimeo. We crossed the finish line in 7:12:55, becoming the first two runners to complete the Grand Teton "Double". I saw Ginette at the finish line and was so proud of her for battling through the marathon. Of course, everyone gave me grief about my wife beating me, but hey, David's wife beat him too ! What's Next ? Ultras ? Post Trail Marathon - I'm not sure where to begin (or end). Physically, it was perfect. I had no issues during either event, other than just being tired. Fuel worked. I was able to run strong at the end of both races. My feet are in amazing shape, thanks again to Drymax Socks. Not a single blister or hot spot from either event. That's 76.2 miles over two days on trails without a blister. I am still amazed by this, and am glad that I made the switch to Drymax last year. The entire week was a great success on so many levels. Our family vacation was a blast. We got to see so many old friends, and met a ton of new ones. It was one of those trips that when you leave, you do so with a sense of sadness and disappointment that it is all over. Well, I suppose it just means we have to go back again next year. Next up : Pacing and crewing. On September 19 I'll head to Newark, Delaware to pace new mom Meredith Murphy at the Delaware 100-Mile Endurance Run. This will be Meredith's "comeback from child birth race". The following week - off to Vermont for the Vermont 50. Oh, that sounds like so much fun! And the trashers - geez, what are they, marathoners? Aren't they local trail users? I am surprised. Anyhow, congrats to you, Dusty, your wife, and all out there for all the great times you had! Wow, and that's with a 10-minute stop to lecture litter bugs. Amazing. I've been saying that a lot to you this year, haven't I? damn, that steak looks good..
and the litter video! comedy gold. anyway, it was awesome hanging out with you guys this past week, really made a special weekend even better. hopefully we'll make it to rockies on Saturday. Great job out there. Congrats to you and your wife. Congrats to you and your wife. Quite an accomplishment. When you get the chance, I invite you to check out this video -- ahamoment.com/pg/moments/view/7216 -- about one man's "aha moment" experienced during a 104 mile race and how it changed his perspective on life. I think you'll enjoy it. Tony, great job and I hope your recovery was quick! Thank you so much for mentioning the Addison's stuff! I appreciate it. Can you email me the photo of us crossing the finish line?